Sometimes we need to sense and measure mechanical forces in our physical computing projects. It might be the load pushing down on a platform or tension on a part. Load sensors come in a variety of off-the-shelf styles to suit the particular configuration of our mechanisms. Feed the sensor data into your physical computing modules and you can do things like adjust how hard your robotic hand grips a ball or see how much power your recently built hot rod engine produces. Today we’ll take a quick look at a few common load cells that are currently available online. Modern mainstream force sensors utilize strain gauges at the heart of their operation. They are made up of high-precision film resistive elements that are meticulously glued to the mechanical load element and deform as force is applied. The deformation changes the electrical resistance, which affects the voltage output of the device. The deformation is exceedingly small with an equally small difference in voltage coming out of the device. It is so small that we can’t accurately measure it directly with most microcontrollers. We have to use a little amplifier board to boost the signal. As an added benefit, the amplifiers also convert the voltages to a digital output that is easily read by a microcontroller input pin. Industry has long used thin-film strain gauges to measure deflection, torsion, compression and expansion in materials, particularly metal. They are used extensively in the space, aircraft and defense industries and have traditionally been pretty expensive to set up. There is a whole science around mounting strain gauges so they give highly accurate readings. A common term is to say you are “instrumenting” your project when you gather data either for prototyping or actual production operation using strain gauges. The advent of off-the-shelf “standardized” load cells, has really picked up in the last few of years. They are pretty inexpensive, accurate (after calibration) and readily available. Load sensors come in different capacities and mounting styles. We’ll look at those aspects next. Most likely you’ll use what’s known as a “beam” type sensor in your projects. This design consists of a simple stick of material, usually aluminum, that flexes ever so slightly under load. The thin-film strain gauges are glued along the beam, mirroring its flexure as the load is applied. Sparkfun has a nice 10 KG straight beam type load sensor for about $9. They also have an S-beam type, that can measure up to 200KG for about $60. You could handle loads up to about 440 lbs. with this bruiser. The S type is just a beam type folded over into a compact shape, thus allowing you to measure higher forces while still being compact and not overly lengthy. Banggood has a decent selection of small beam type load cells. Another load cell you might use is the disk type. These are round devices and you apply a force on the top and bottom. Like the beam cells, disk cells use the same strain gauge innards to measure the deformation and output a voltage differential. Button type load cells are used in applications like electronic scales and typically appear in groups of four. One button cell is placed at each corner of the scale, equal distance from the center. The wiring is a little more complicated with the outputs combined to give the overall weight or force. You’ll see them as a set along with an amplifier board, bundled into the price. Here’s one from Banggood that will measure up to 50KG and costs a little over $7. Amplifier boards convert the small voltage differential from the load cell into a digital output that is then fed to our microcontroller. The general purpose HX711 24-bit precision analog-to-digital amplifier board is very popular. You can buy two of these babies on Amazon for a little over $6. You’ll see individual load cells, individual amplifiers and bundled packages. 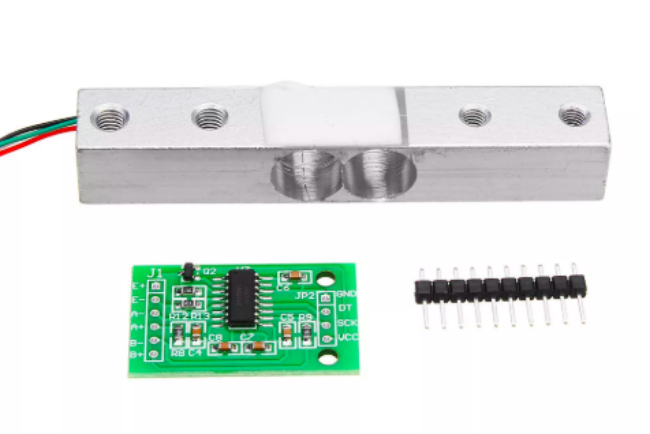 You have to use a load cell with an amplifier, so make sure you have both when you order parts for your project. The wiring is pretty much the same for all the different types of strain gauge loads cells when you hook them up to the amplifier. Operating voltage is from 2.6 to 5.5 volts, so they can be used with a 5-volt Arduino, as well as 3.3-volt Raspberry Pi and ESP8266 microcontrollers. Be aware that if you hook the two inputs up backward your load readings may be reversed. Just swap the leads to get your numbers going in the right direction. Reading the output from the amplifier is straightforward on an Arduino. Install the HX711 library from the Arduino “Manage Libraries” menu under the “Sketch” tab. Then in the code include the library file name, initialize the digital pins that will read the amplifier outputs and start printing the values. Not much to it really. Load cells are the force sensors of the physical computing world. Over the past few years, we’ve seen an explosion of these devices from quite a few different vendors. We’ve discussed a few of the DIY/Maker versions that are readily available over the web. Lot’s of commercial vendors make force sensors, with expected corresponding differences in build quality, capacities and price. Transducer Techniques has some disk type load cells with a 10,000 lb capacity for $540. Their $850 heavy-duty beam type offering will handle 20,000 lbs.